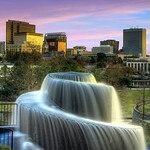 Finlay Park, at 14 acres (57,000 m2), is the largest and most visited park in downtown Columbia, South Carolina. The park opened in 1991. Initially named Sidney Park, it was renamed after a former Columbia mayor Kirkman Finlay. 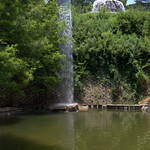 In the park there is a scenic waterfall along with cascading mountain type stream falling to the park lake. There are picnic tables, two playground areas and a cafe. The park is a favorite for families. Outdoor movies are played on Friday nights during the summer months. 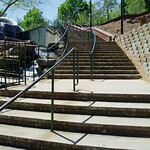 The park is also host to numerous events and festivals, including the Sizzlin' Summer Concert Series. The free outdoor concerts (7 - 10 p.m.) run for 13 weeks beginning May 24th and include blues, beach, classical, contemporary/top 40, country, bluegrass, reggae and more. Admission is free and picnics are welcomed (glass containers, grills, pets and radios are not permitted).